After a bumpy start, the month moves along quite nicely, with exceptional avenues for advertising, writing, publishing, and travel leading your progress. You still have to deal with a few restraints, but you’ve always been good at finding a way around obstacles! You still have to pay extra attention to health matters. If you’re feeling run down, examine how you’re handling stress. It’s quite possible that eliminating a few stressors will also help diminish your increased physical sensitivity. Venus moves into your sign on April 12, increasing your interest in love and romance and boosting your powers of attraction. You’re ready for a more open approach, shared ideas, and a meeting of the minds after the Moon on April 15, and you may meet the perfect person or be in just the right circumstances to broaden your relationship. An old love may surface during the Moon on April 30. Any feelings remaining? Conservative attitudes may have your ingenious options penned against the wall, especially if you cave in to pressures from April 1 to 10. But after April 17 you’re ready to meet resistance face to face, and you can make significant progress centered on future plans. If you’re getting more hot air than real substance, wait until after April 25 to stimulate momentum. Finances improve after April 17. 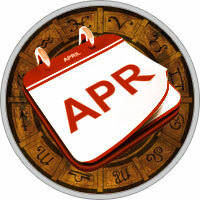 Your alert focus after April 18 helps you stay on top of any situations that could involve deception or undermining.